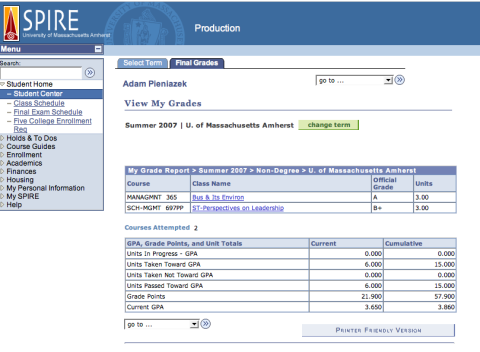 Four courses into my collegiate career at The University of Massachusetts at Amherst, my Grade Point Average was a perfect 4.0! The grades for my graduate course, Perspectives on Leadership,were released a few days ago and, unfortunately, the dream of graduating with a 4.0 is officially over. It was a long and hard fought battle folks, but we’re just not going to see the perfect game tonight. That’ll teach me to take a graduate course while I still have ten undergraduate courses to take; actually it won’t as I’m planning on taking a few more graduate level classes to complete the 30 credits blocking me from an expensive and valuable piece of paper. Yes, yes, my GPA is still an impressive 3.86, but the dream of perfection is gone. Ah well, there’s always graduate school.